Iso Whey Zero Review | Does Iso Whey Zero Work? Nothing is more important to a serious bodybuilder than knowing that they are doing everything possible to attain the ultimate physique. That means that they know that each and everything that they do from choosing and actually working at their training regimen to making the most of their recovery periods to making wise dietary choices. 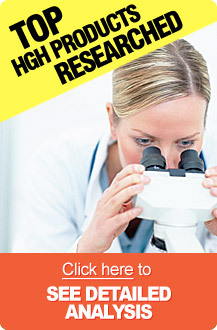 Another critical choice comes when it's time to choose the right bodybuilding supplements. Since getting the proper amounts of protein is so critical that it's no wonder why so many athletes have a tough time making the right decision. It's even more difficult because of the seemingly ever growing number of choices in protein powders coming onto the market all the time. It's true that many of these are just updated versions of existing products but there are also many completely new products coming online all the time. The real problem facing athletes and bodybuilders in particular is the fact the even though most of these products tend to have very similar sets of ingredients and often even more similar claims. And, even though that might lead many to believe that these products, in general, must be pretty much the same that assumption would be completely wrong. The reason for this is quite simple - even if a product has all or nearly all the same ingredients the resulting benefits from using them could be completely different if the quantities or percentages of the ingredients are radically different. This being the case it's quite clear that the only way for consumers or reviewers to know how well a product works is to analyze the actual formula used in its creation. Taking all these facts into account we have decided to take a long hard look at one of the most talked about bodybuilding supplements on the market today - it's called Iso Whey Zero. 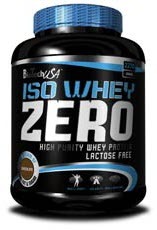 A product of BioTech USA, Iso Whey Zero claims to be a zero sugar, zero trans-fat and zero lactose whey protein powder product that provides athletes and bodybuilders a great solution for building large amounts of lean muscle mass and gain a competitive advantage in all athletic endeavors. It is produced in many different flavors, including chocolate, vanilla, coconut, banana, cookies & cream, gingerbread and more. Users receive a 21.4-gram dose of pure protein, put together with a wide array of amino acids which are essential to build lean muscle mass, enhancing muscle recovery rates and to promoting overall health. Another claim is that Iso Whey Zero contains the purest type of whey protein which isolates the features of cross-flow micro filter technology. This method allows the protein to be absorbed easily by the body with an increased rate of activation. This combination of whey protein and amino acids is designed to help to relax blood vessels, carry oxygen, protein and other nutrients which are essential for key muscle groups to grow. Many reports show that this type of protein, known as whey protein isolate, contains the purest amount of protein per gram (more than 90% protein content) and does not contain any lactose or fats because they have been pre-processed. EAAs (Essential Amino Acids): These essential amino acids contain valine, histidine, methionine, threonine, isoleucine, lysine, leucine, phenylalanine and tryptophan. Each of these include a 25 gram serving and a 10.4 grams EAAs count. CAAs (Conditionally Essential Amino Acids): These critical amino acids include arginine, proline, glutamic acid, tyrosine, cysteine and glutamine. Each 25 gram serving includes a 6.4 grams CAAs count. NAAs (Nonessential Amino Acids): These additional amino acids include alanine, glycine, aspartic acid and serine. Each 25 gram serving includes a 4.6 grams NAAs count. Although a certain amount of information can be cited as supporting the claims regarding Iso Whey Zero most of that data is related to the ingredients and the effectiveness of each of the individual elements. When it comes to clinical research, studies or trials there is far less verifiable or convincing evidence to suggest that the products' effectiveness is well supported in any quantifiable way. As any experienced consumer knows, user testimonials are a highly prized selling tool for producers of any type of product. However, because these testimonials or user reviews are directly chosen by the companies involved they are obviously biased which is no secret based on the fact that these company sanctioned reviews are always highly positive in nature. Taking that into account we set out to find a number of sources of less biased user reviews. To do this we searched a number industry related websites with no apparent affiliation to BioTech or Iso Whey Review and several chat rooms dedicated to this subject. What we found was a large number of user reviews and the vast majority of them were highly negative in the view of Iso Whey Zero. The main theme among these negative reviews was that they were not satisfied with the results they experienced. Furthermore, many of those who stated that they had used another protein powder based product found that Iso Whey Zero did not perform as well as previously used products. Although there is no information that we could find that offered any credible evidence that any of the ingredients included in Iso Whey Zero were known to be of a serious health risk or cause other side effects such as allergic reactions it is always advisable to consult with a physician for other qualified medical professional before beginning use. A five pound container of Iso Whey Zero can be purchased online for $181.00. One serving size equals 25 grams and should be combined with 200ml of skimmed milk or cold water. Further instructions state that it should be taken every morning after a workout session. On days that do not include training sessions a second dose should be taken after dinner. As we discussed at the beginning of this review we talked about how important each and every aspect of a bodybuilders' training regimen is from their workout to their recovery methods to their diet to the supplements they take. When it comes to choosing a protein powder which is so critical to getting the results needed to achieve the ultimate body there are many things to take into account. Among the most important issues at hand is the fact that, even though so many of the numerous protein powder products seem to have pretty much the same ingredients and the same basic claims, the results are largely dependent on the formulation of these ingredients. This fact makes it rather difficult for consumers and reviewers to assess how well the product will work. Taking all these facts into account there are multiple facets of Iso Whey Zero that anyone considering its use need to consider. Among them are the ingredients themselves. Although there are only a few ingredients it can safely be said that they are rather common among products of its kind. Still, without any useful amount of information related to clinical research, studies or trials that support the claims of this particular formulation. When taking these points in conjunction with the large swath of independent user reviews that are highly negative in their opinion of Iso Whey Zero there is no real way to consider this version of Iso Whey Zero to be a top choice for serious bodybuilders or athletes of any kind. For more information about high quality, top ranked protein powder products available on the market today, click here.